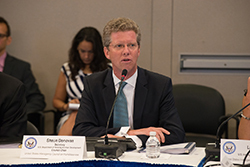 On July 18, 2014, HUD Secretary and Council Chair Shaun Donovan convened Council agencies for the second meeting of 2014. Council agencies discussed efforts to leverage Federal mainstream resources in the areas of housing, employment, income supports, education, and health care to end homelessness. The Council also discussed the proposed amendment to Opening Doors and elected new Council leadership. This was Secretary Donovan’s last Council meeting as HUD Secretary and as Council Chair. Secretary Donovan—now Director of the Office of Management and Budget—reflected on his encounters with homelessness from his childhood in New York City, where he noticed the explosion of homelessness on his morning walks to school, to his volunteer work at a homeless shelter in college, to his internship at the National Coalition for the Homeless. “I never could have imagined I would be sitting here at this table with all of you helping lead what I think has been the most comprehensive, smartest, most aggressive campaign against homelessness this country has ever seen, culminating in a President who is actually willing to say we’re not going to just put a bandage on this problem. We’re going to end it,” said Donovan. As Director Donovan moves to his new role, the Council elected Secretary of Labor Thomas Perez as Chair and Secretary of Health and Human Services Sylvia Mathews Burwell as Vice Chair. Secretary Perez noted that it was an honor and that Secretary Donovan’s leadership set a high bar for the Council and the nation’s efforts to end homelessness. The Council discussed progress and planned actions to increase the degree to which Federal mainstream programs and resources are being brought to bear in efforts to end homelessness—a core tenet of Opening Doors. Ending homelessness with targeted homelessness programs alone is not possible. Federal mainstream resources not specifically targeted to homelessness must also be leveraged. Whereas the combined set of Federal programs specifically targeted to homelessness total about $5 billion in FY 2014, mainstream programs are significantly larger in scale. HUD’s Housing Choice Vouchers, for instance, are funded at more than $19 billion in FY 2014 and TANF is funded at over $16 billion. Federal spending alone on Medicaid in FY 2014 is projected at almost $300 billion. These programs provide affordable housing and services that are critical to providing pathways out of homelessness. At its July 18 meeting, the Council reviewed strategies to increase the impact of eight mainstream programs— Housing Choice Vouchers/public housing, HUD multifamily housing, workforce systems, schools and local educational agencies, Medicaid, TANF, Head Start, and Supplemental Security Income (SSI) and Social Security Disability Insurance (SSDI). Richard Cho, USICH Senior Policy Director and Judith DeHaven, Director, Program Support Division, Office of Public and Indian Housing at HUD, presented these strategies to the Council, describing how agencies are using available policy tools to increase access to programs and services for people experiencing homelessness. Council agencies looked to HUD’s work to engage public housing agencies as an example of what federal agencies can do to leverage mainstream resources. DeHaven described how HUD has been able to promote greater access to Housing Choice Vouchers and public housing, increasing new admissions among people experiencing homelessness significantly over a short period of time. DeHaven said constant messaging from senior leadership to HUD staff further reinforced their efforts to promote these strategies. Building on this example, HUD, the Department of Health and Human Services (HHS), the Department of Labor (DOL), the Department of Education (ED), and the Social Security Administration (SSA) developed related strategies for multifamily housing, Medicaid, workforce systems, schools, Head Start, and income supports. The Council adopted the strategies and will review progress on them in the coming months. Along with leveraging mainstream resources, using existing targeted homelessness assistance resources more strategically is critical to ending homelessness. Scarce resources must be used strategically and should target people who are the most vulnerable. USICH has created a tool to help communities assess the strategic value of their Continuum of Care (CoC) funding, as well as to help identify mainstream funding alternatives that will allow CoC resources to stretch even farther. Council agencies discussed also the proposed amendment to Opening Doors. USICH Executive Director Laura Zeilinger explained that Opening Doors remains the right plan with the right set of strategies. When the plan was launched in 2010, it was presented as a living document, informed by the most current information and evidence on what works. In addition, while the nation has made progress on ending chronic homelessness, the lack of Congressional support for needed resources means we will not reach our goal to end chronic homelessness in 2015. “If Congress acts to fund the President’s Fiscal Year 2015 Budget requests for 37,000 new units of permanent supportive housing, we can bring the national inventory of permanent supportive housing to a scale that will end chronic homelessness in 2016 and prevent its recurrence.” Accordingly, USICH proposes amending the goal to 2016, with the explicit acknowledgment that achieving that goal would be contingent on appropriations. USICH is seeking broad stakeholder input into the proposed amendment to Opening Doors. Already, hundreds of stakeholders from across the country have either participated in a community input session or have shared their ideas through an online forum. We urge you to participate in this process.